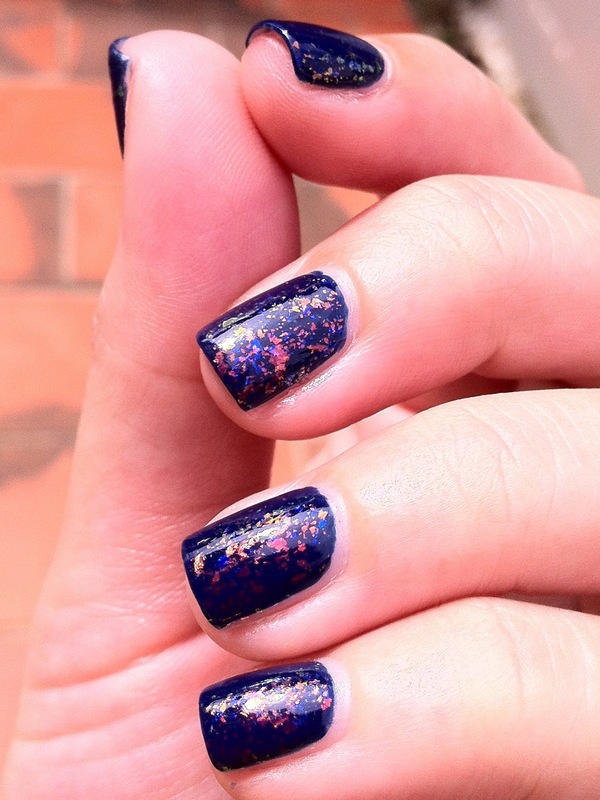 I finally picked a glitter topper to go with the navy polish I had on two days ago. Well, not glitter per-se but rather than a flaky topper! 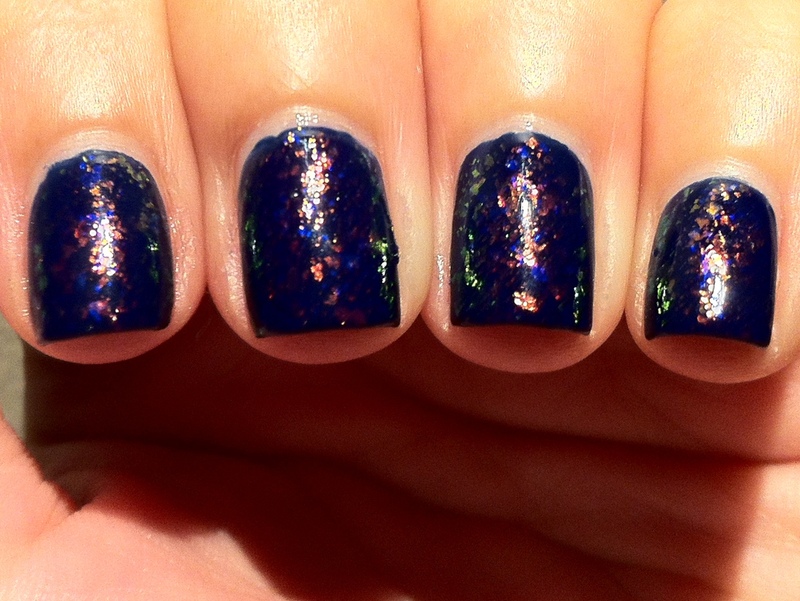 This is the beautiful Seduction by Cult Nails. 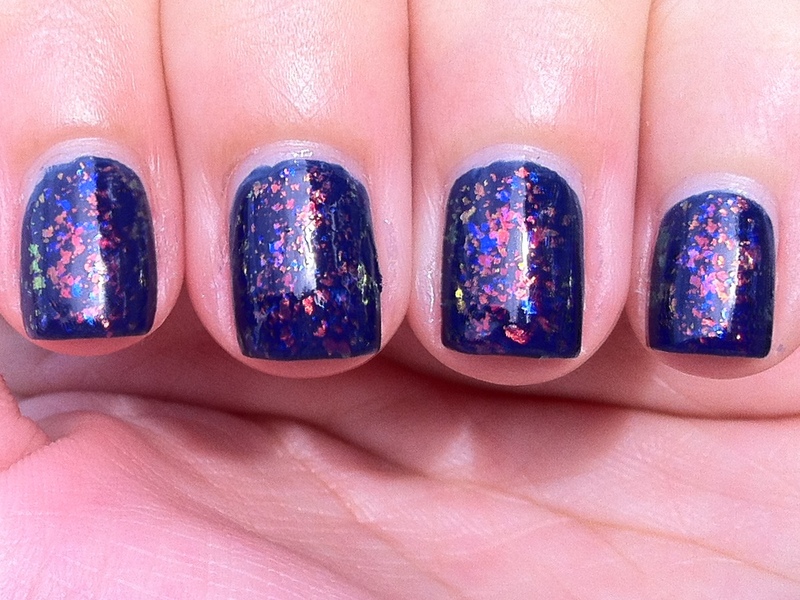 I am sure many of you are familiar with this polish’s sister – Clairvoyant a.k.a. Unicorn Puke from Cult Nails. 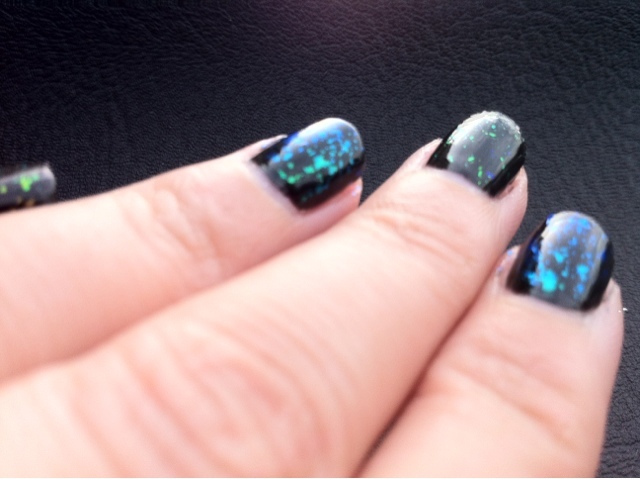 Unfortunately for me, Unicorn Puke was long discontinued by the time I came to know about Cult Nails. It is now going at ridiculous prices on eBay and blog sales mind you! This is one gorgeous flaky polish I tell you! 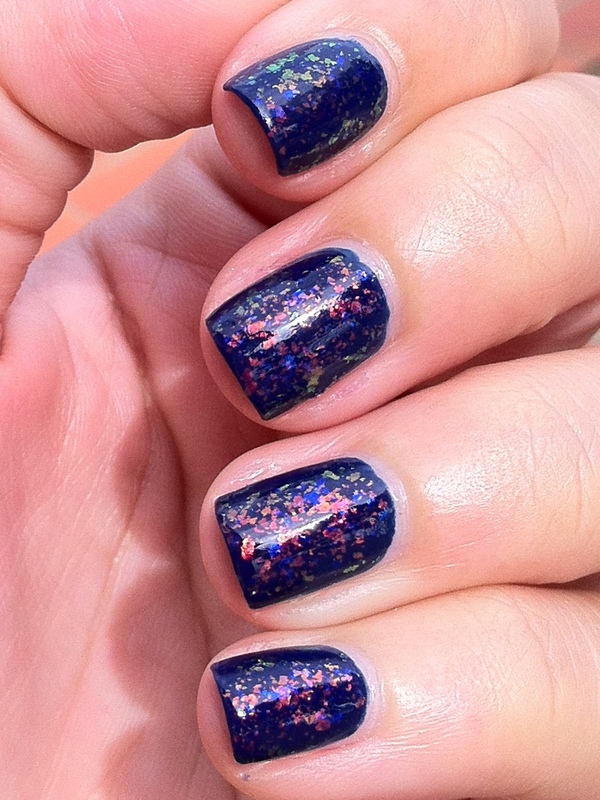 Unlike Essie’s Shine of Times, the flakies in Seduction are more subtle and less dense. 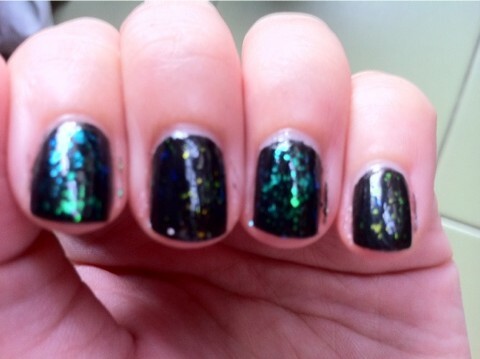 It took me 2 coats of Seduction over China Glaze First Mate to achieve the opacity I desired. The flakies in Seduction flashes red, blue, purple and the occasional green – which was crazy hard to capture on camera! I realised that the green comes out in lower light conditions. And also when my hands is wet. So off I went and wet my hands and hide in the shade to capture this gorgeous photo! The green finally showed up!! 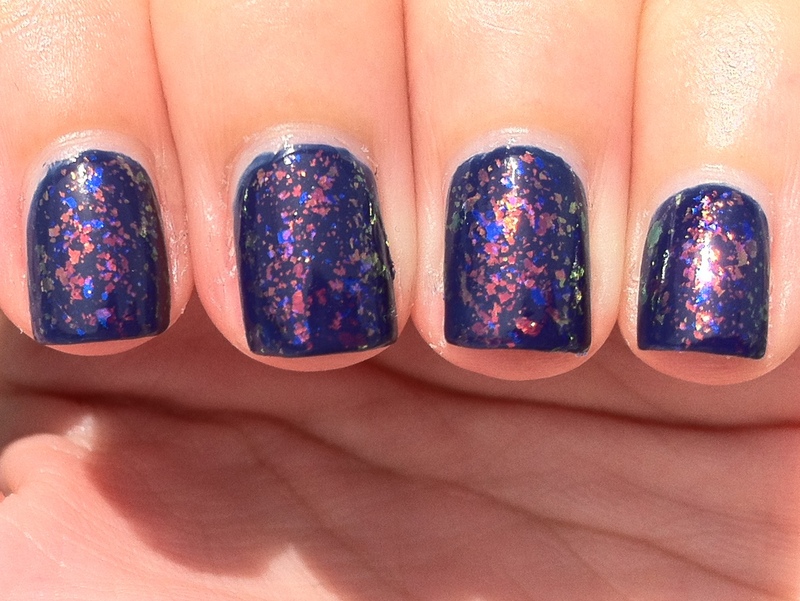 One more photo of this lovely polish to drool over before I end this post. To make my Monday more interesting, I decided to go with a mesmerizing manicure to keep me distracted if Monday blues did hit me. 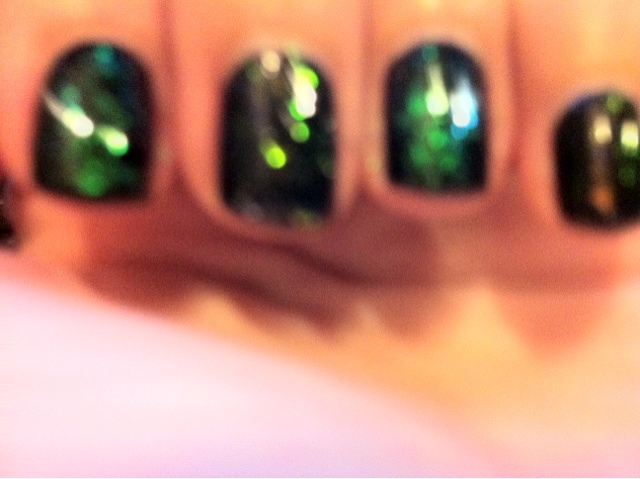 It was a toss between Essie’s Shine of Times or OPI’s Teenage Dreams. I went with Shine of Times for it’s, erm. neutral look of the two. Haha! 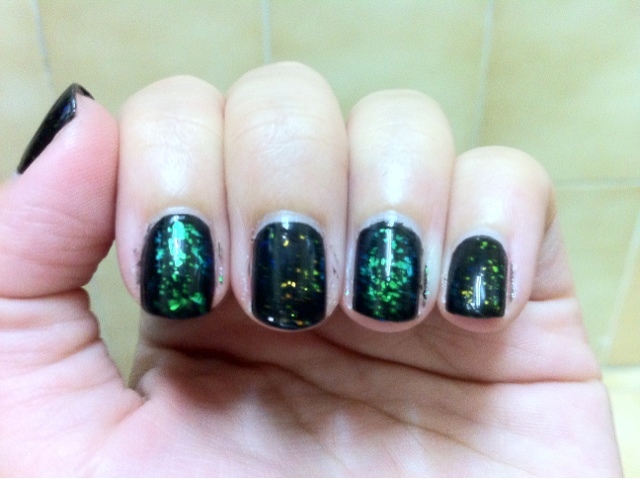 Shines of Times came out in 2011 under Essie’s Luxeeffects line and I am loving it! 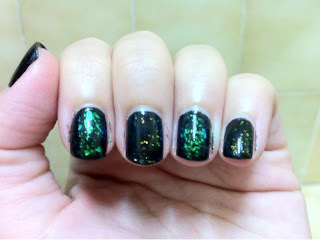 I almost did not get it when I saw Luxe and Lush from the CG Hunger Games collection came out. L&L was out of stock when I got this from NailFiesta ages ago! No regrets now! On bare nails, Shines of Times shifts from pink to orangey to gold, yellow and even green in different lights! The first photo in this post shows it flashing green and the photo right above shows it leaning to the pink-oragey side! Above is one that shows off the yellow/goldness of the flakies and below… POW! Golden goodness! What do you think of this polish? Would you wear it bare like I did or do you prefer it layered over something? *rawr* says the claw with the very stained nails! 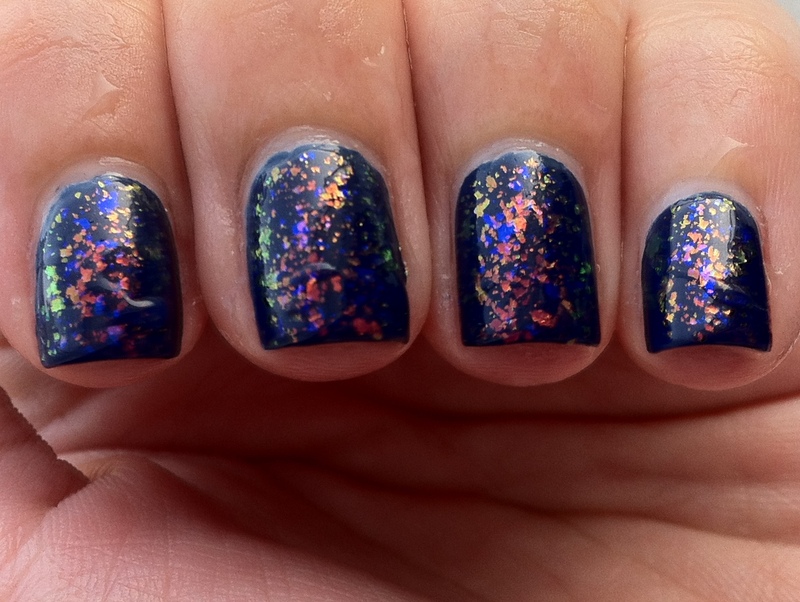 As you know from my last post, I received some flakies polish from Llarowe that day. And me being me, I couldn’t resist them and HAD to try them on immediately. 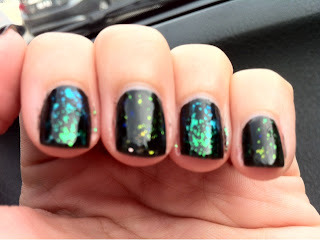 HITS Jazz Flake has flakies that shift from green to a nice teal in the sunlight. I am in love with the colour and the application was great. I only used one coat of HJZ and as you can see. the whole nail is covered already! You have to be careful though, the polish seems a bit thick for a brand new bottle. Next up is Ludurana 3-D Flake Flash. Compared to HITZ Jazz Flake, it had much less flakes per stroke. These are actually 3 coats of it in the photos. I think that it might be because of the suspension base being a little watery. I am tempted to leave the cap off for a few minutes to ‘dehydrate’ it a little but I am worried that it would end up too goopy and cant be used anymore. The color of L3DFF is much more dynamic than HJZ. There are red, green, yellow and even a little hint of blue in them when the light hits them. My fingers are painted HITZ, Ludurana, HITZ, Ludurana in the photos. This is my favorite shot of the polishes which I took when I was on the way home from work! This is the only shot that shows off the red/orange flash in the Ludurana polish. 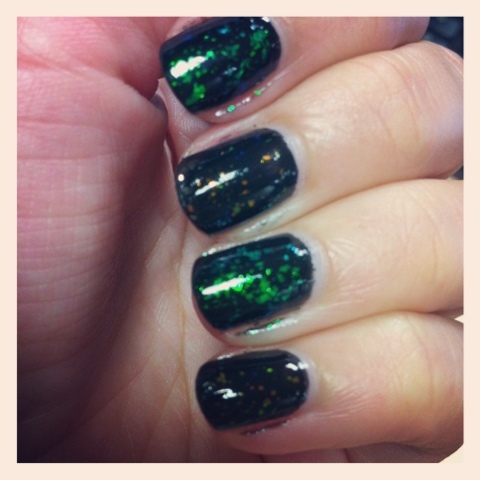 And last but not least – a photo taken with the Sierra filter on Instagrm, This photo actually shows off the flakies the best! 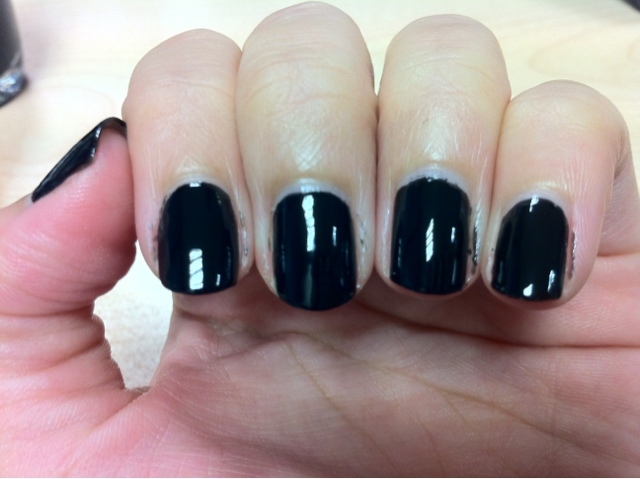 OPI Black Onyx has a very good formula. The first coat was a little streaky but it evened out nicely with the second coat. I usually shy away from dark colours but I love how Black Onyx turned out. Its a very nice and warm color. For one they stock up on a lot of flakies from many different brands in their shop and they have a huge collection of holographic polishes from all over the globe. And the best part to me – they ship INTERNATIONALLY at a decent rate. 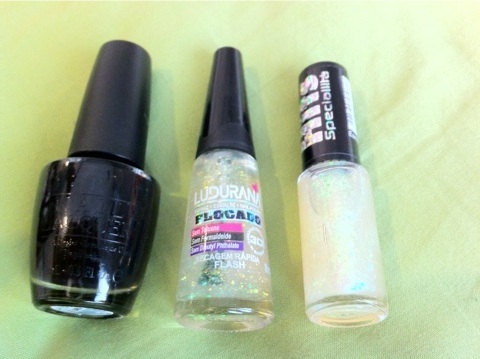 All excited I quickly went thru their shop and picked 2 polishes that interest me the most – Ludurana 3-D Flake Flash and HITS Jazz Flake Nail Polish. When I checked out I was all smiles because my shipping is —– USD5.96 only!! Now on to the hard part – waiting for the polishes to arrive safe and sound!